What is a Monophonic Synthesizer? Why use Pulsar as a Monophonic synthesizer? Welcome back to another Reason tutorial. In this tutorial I would like to explain some of the features of Pulsar. Pulsar is a Dual LFO and is available at the props shop as a Rack Extension. Reason 6.5 was shipped with a feature called Rack Extensions. 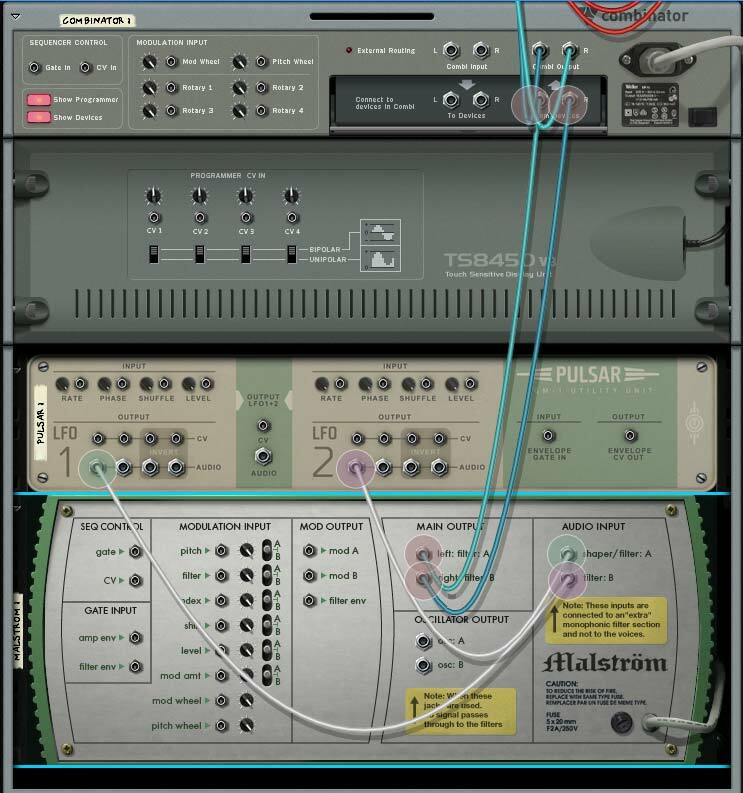 One of those rack extensions which was made by propellerheads on the launch of Reason 6.5 is the Pulsar Dual LFO (next to Radical Piano and Polar). Pulsar is marked as an utility type of Rack extension, because at some point it is a utility to shape LFOs. So the concept of using LFOs is probably something which isn't brand new, however Pulsar does bring a few nice additional features which makes it an interesting device to throw in the rack. So lets look at what Pulsar has got. And next to this we have tempo sync mode and envelope sync. We'll be going in depth about these settings. The setup we'll using for explaining things. The LFO 1 is here by connected to the pitch of the Malstrom. Pulsar is shipped with 9 different wave forms namely: sine, triangle, square, sawtooth, random, slope, 3 steps, 4 steps and 4 steps up down, All these wave forms are Bi-Polar, which means that the all have positive values and negative values. Wave forms determine the shape of the LFO and how they react on a certain CV setting and therefor changing the wave form can have a drastic impact on how the setting behaves. The only work around I have encountered so far is using Thor as a modulator input / output source. Since this method gets rather 'complex' for some, since it requires the use of the Modulation Bus Matrix, it made perfect sense to have a single devices that makes the work flow a lot easier to get the same thing done. Another interesting feature in this case would be using the LFO 2 to LFO 1 level amount, but we'll get more to that one in a later segment. While having the level, we can alter the output amount to the destination (the setting which is changing by the LFO). This works pretty well if you are trying to setup an ambient stage or something, while you want to alter the settings over a longer period of time. 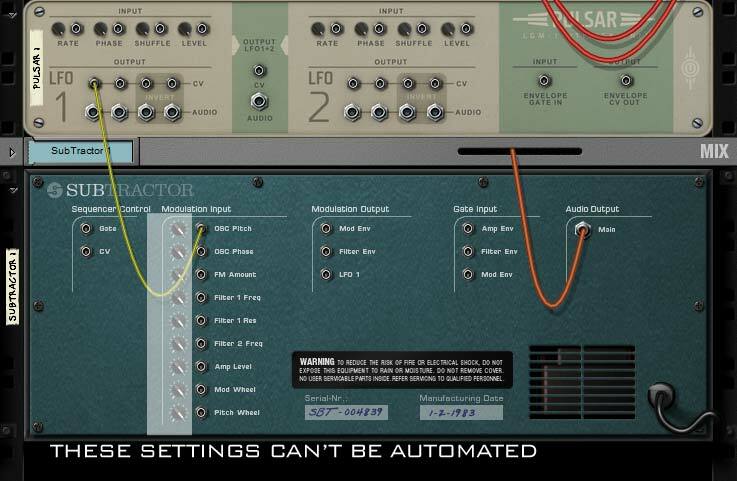 And this case you could alter the LFO1 level amount to make these changes. The effect of phase (as in having it fixed) will barely be noticeable when it comes to using the LFO and connect the output to a setting. You will most definitely notice the difference when automating phase, it kind of is comparable as changing the rate slightly up or downwards. In most cases it depends on how you would use it off course. 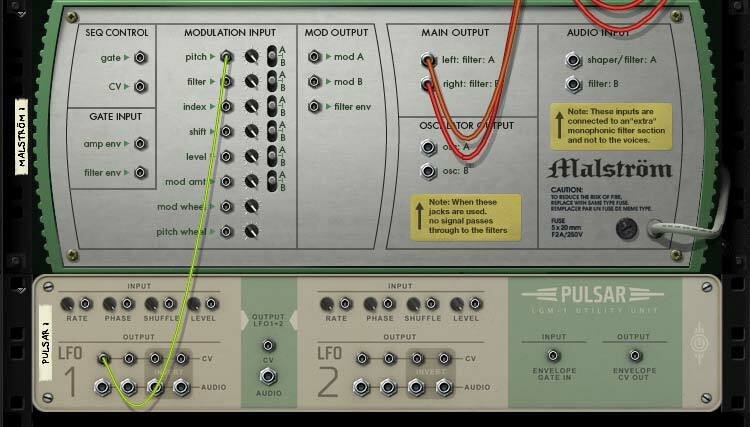 You will get more out of Phase when using Pulsar as an analog synthesizer module (which we will cover later on). Shuffle is something which is rather interesting as an effect, however you could if you want get a similar setting using an LFO on the Phase (CV cables). Ok, that might get complicated. Shuffle on the other hand is similar as changing the rate while the cycle is running. This results in to which would look rather different then, lets say, a straight forward sine wave. In this context the pitch is changed using the LFO. And by hearing it, you will notice that the cycle takes place in 2 parts: 1 long change, and one short change. And this is all happening with in 2/4th. Shuffle van be ideal using shuffled track (for instance: a Regroove mixer) or if you want to have something which changes less robotic. An LFO is usually pretty "stiff" and shuffle can make the difference there. LFO lag softens up the hard edges of the signal path. Which usually results into a new wave form (with the exception of sine) and has a less rough feeling to them. Lag would be similar as using an low pass ladder filter on top of a wave form. However, the difference here is that we using waveforms to be connected to any CV signal. So the outcome may be less when using a CV connection. However Lag will become noticeable when using the Pulsar device as an analog synthesizer. Pulsar Square LFO with 56% lag. So far we have explained the basic features when it comes to an LFO setting inside a single Pulsar LFO. The other goodies would be using an LFO 2 to LFO 1. Since a setting like this can recreate a new set of LFOs if you will. LFO 2 to LFO 1 Rate is something similar as FM. It tends to speed up the waveform for LFO1 depending on the maximum output of the LFO2. The higher the values of LFO2, the higher the rate of LFO1 will become. A similar method already exists using Reason, for instance using Thor while connecting LFO 2 to the LFO 1 Rate does a similar thing. The LFO 2 level to LFO 1 is AM or Amplitude modulation on top of LFO 1. Which means that the signal amplitude changes over time. You could get a similar setup inside Thor and a combinator, but this one would require some tricky stuff using the Amount as a modulation input. So yeah, Pulsar makes a similar setup a bit easier. As an example I am posting a single Reason while where the LFO 2 is connected to the Level amount (second knob). This type of LFO setting can turn your synthesizer into a new pulsing rhythm type of module where the sound kind of changes 2 times, rather then having one single LFO doing all the work. These type of LFO settings would probably work best on pads, since they have a longer run time (long notes etc). I don't have any application yet for using 2 LFOs using one shots (short bursting sounds) on that matter while I am writing down this massive Reason tutorial. Another interesting feature would be using the Envelope segment of Pulsar. Which is kind of similar as using the Envelope connected to the LFO rate or level using a thor patch. The only real main advantage using pulsar would be: it goes a lot quicker to set things up... trust me on this one. The idea behind an Envelope connected to an LFO is simple, you change the LFO parameters (depending on which they are) and use an Envelope to control this. And envelope is setup where you have a segment called Attack, Decay, Sustain and Release to control the parameter. Only disappointment factor here would be that Pulsar only has an Attack and Release. However the Level knob is the replacement to the Sustain. It its default state, you will need to Trigger the envelope by using the "Trig" knob. There are different methods to 'trigger' the envelope though. The envelope setting comes to good use though when turning Pulsar into an Monophonic Synthesizer. Something that has been brought up a couple of times is using Pulsar as a Monophonic synthesizer. The main idea here is to use Keyboard Tracking (KBD) at full so the LFO rate starts to change on height of the note. 1. Set the LFO levels all the way down, other wise the LFO will output a constant tone. 3. Turn up the LFO -> Level on the Envelope section, so the envelope will now control amount of output on the LFO. 6. Create a sequence track for Pulsar (Right click and click 'Create Track for Pulsar', or right click on a knob and click 'Edit Automation' creates a track too). This leads into a different topic. A Monophonic Synthesizer is a synthesizer that uses single notes only. A monophonic synthesizer is (in the normal world) not able to play multiple notes at the same time. The counter part is a Polyphonic synthesizer (where polyphonic means it can use more than one note at the same time). So with that being said, you will need more then one Pulsar if you want to play multiple notes at the same time. A valid question and I would like to tell my own insight on the subject (since this is an opinion I am giving, not fact). The Pulsar has some unique features when it comes to shaping the LFO. Shuffle and Lag would be two of them which makes Pulsar an interesting device. Next to this there is the LFO 2 to LFO 1 (Level and Rate). Do I need to say that using one single Pulsar device can create all kinds of different wave shapes which are pretty unique? I think I just did... But this is kind of the nice idea behind the Dual LFO device. Sure, one would use Subtractor to get close to similar sounds or use different type of Square waves and connect those to a Pulse Width modulation while using Thor. There are moments that Pulsar starts to open the envelope, but never closes it (and thus the level keeps going through the Level). Usually this happens with a random low frequency. How this issue can be reproduced I can't tell. I can only type about this issue since it happened to me twice while making this complete tutorial. If I can confirm when this happens I will be sure to write about this. This is the amount of Hertz of the perfect C note for the sound to be in sync with keyboard (yeah, lets go technical). The main issue here lies that some patches from the 'sound bank' use 130.2 Hz as a root frequency for C. So since we are nitpicking here: this is not C3... and gets off eventually when you would be triggering higher notes (at least it should in theory). Or the 130.2 Hz,which Pulsar claims to be using while hovering over them, is wrong (that could be another explanation). This might lead into the debate about "what is the perfect C note". The only thing I would like to do is tell you how to get the C note without having to know how much Hz precise a perfect C note is. Step 1: Turn tempo Sync mode off on the LFO. Step 5: Check the "Receive notes"
The error margin between 1.05 and 1.046 is lesser than 130.8 and 130.2 if you would use this on an exponential scale. There are multiple ways to setup the audio connection using Pulsar. First (and most easiest way) is to use one single LFO and route audio cable to the left in of the mixer channel. This makes the pulsar device a Mono device (similar to the subtractor for instance). 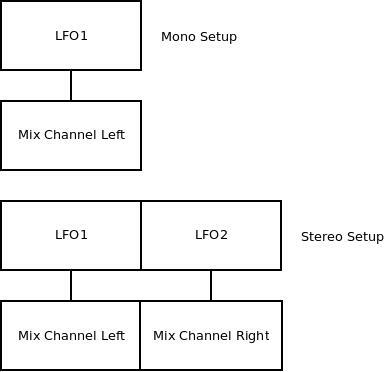 This setup would be ideal when using LFO2 to connect to LFO1 to reshape the wave form of LFO1. While using both LFO1 and LFO2 you can use Pulsar as a stereo device. By using LFO 2 (or LFO 1) on a different frequency create a detuned sound. While using a Pulsar device as a monophonic synthesizer you are able to setup multiple routing schemes for making patches and so on to make some unique sounds with it and expand on what Pulsar can become. One of these connections could be using the Malstrom as a filter device, or use Thor instead. The malstrom is probably more straight forward as an approach since it only requires a few audio cables back and forth. Even while using a mono signal, you could turn this into stereo by using the Malstrom right output and connect this back inside the Mixer channel input Right. On the malstrom you can set the spread knob all the way up (Maximum value 127). And last you can use the Filter knobs on the front panel (Filter A and Filter B) to make differences over left and right again. This turns the mono signal into a stereo signal again while using a single audio source. A similar setup you could do while using Thor Filters to make the initial connection. This however requires a bit more work to make the initial connection, and second you will need the modulation bus matrix to make the initial connection. Some of the patches I am providing are using this type of connection (one example would be called "Square Pulsar Chorus Bass". Located in the next example file. So you can look these up if you are unable to make this work. Interesting. I just got the 4 phaze LFO, which is similar with a few extras (differences actually) thrown in. Seems like an interesting device although it is just one lfo set up in 4 phases. Gonna be playing around with it.